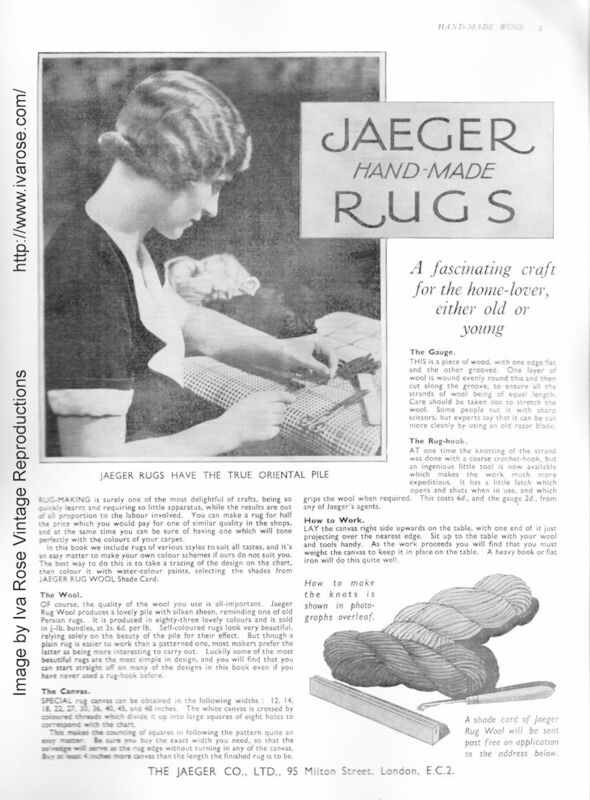 Jaeger is not a name normally associated with latch-hooking, but the company produced at least one latch hook booklet called "Jaeger Hand Made Rugs" in the 1920s/1930s. 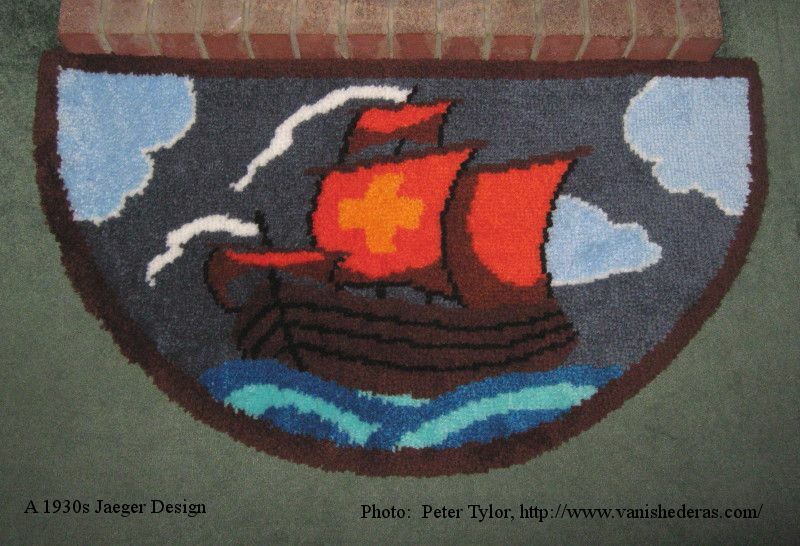 This may have resulted from the latch-hooking boom along with their association with providing woven woollen rugs to the British Army during the war. 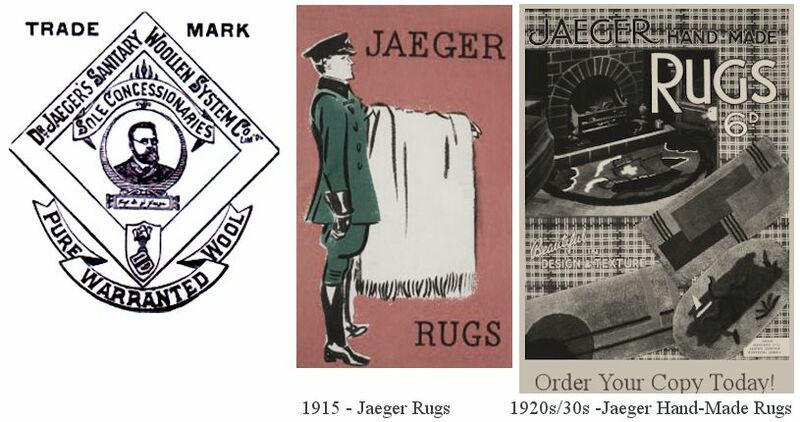 Jaeger was established by British businessman LRS Tomlin as "Dr Jaeger's Sanitary Woollen System Co Ltd" in 1884, capitalising on a craze for wool-jersey long johns inspired by the theories of German scientist Dr Gustav Jaeger who advocated wearing animal fibres (not cotton) next to the skin. By the 1920s it had switched to fashionable woollens. In the 1930s, Jaeger opened a store on Regent Street, London selling stylish, but affordable, British-made garments. Jaeger's yarns were popularised by their knitting patterns in the 1940s. In 1967, it was bought by Coats Paton, but by the 1990s it was struggling to compete with European brands and in 2003 Coats sold Jaeger (which then had 250 shops) for a nominal fee to entrepreneur Richard Thompson. That same year, Thompson resold the ailing ("on its knees") Jaeger to retail entrepreneur and British Fashion Council chairman Harold Tillman. By 2011, Jaeger had 45 UK stores and shipped to 38 countries worldwide. In 2012, it was again in difficulty and was sold to Jon Moulton.